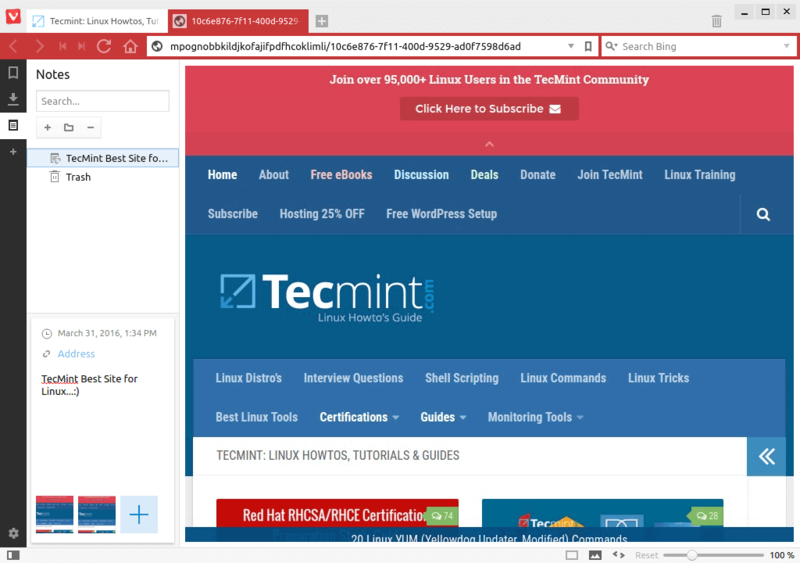 Vivaldi is a Chromium/Blink engine based web browser with very appealing interface. The browser is tab based thus allowing user to open multiple tabs and switch between them using input devices. 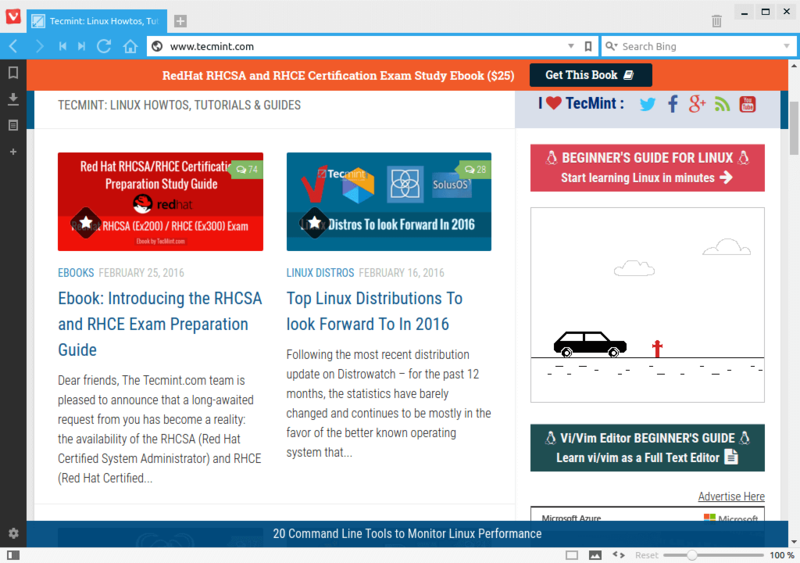 The browser is designed to fit all the open tabs in one windows. In the year 1994, two programmers Jon Stephenson von Tetzchner and Geir Ivarsøy started working on a project. Their idea was to develop a web browser that could run really fast on low hardware. This led to the birth of Opera web browser. Opera later become famous as an important web browser. Group grew into community. Community stayed close to their users using My Opera. My opera served (Yeah correct! It was shut down later) as virtual community for Opera web browser users. My opera offered services like blogs, photo albums, email service, My Opera Mail, etc. Later My Opera was shut and opera changed it’s direction. 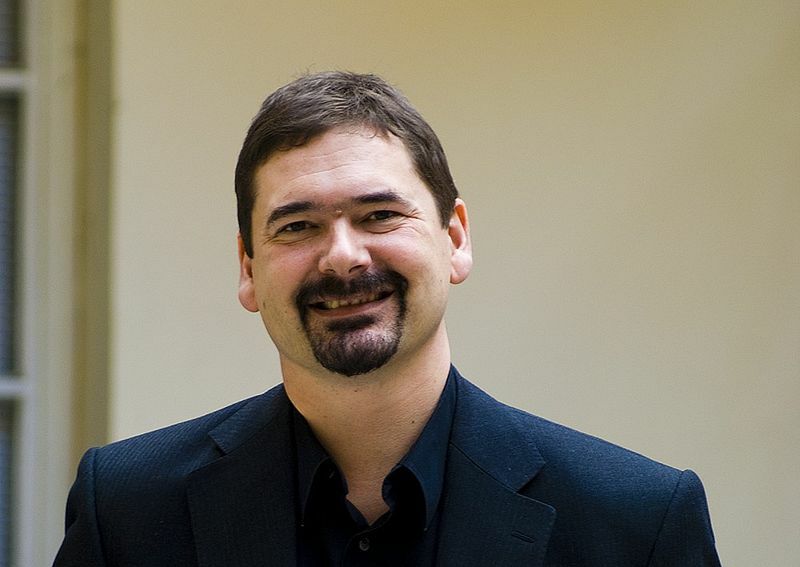 Jon Stephenson von Tetzchner was not satisfied by this decision believing that opera browser was what the community wanted. Hence Tetzchner launched Vivaldi community and The Vivaldi web browser was born. Interface: Minimalistic interface with basic icons and fonts. Save Tabs Session: A Session is a set of tabs that can be reinstate for later use, this will help users to remember recently visited sessions. 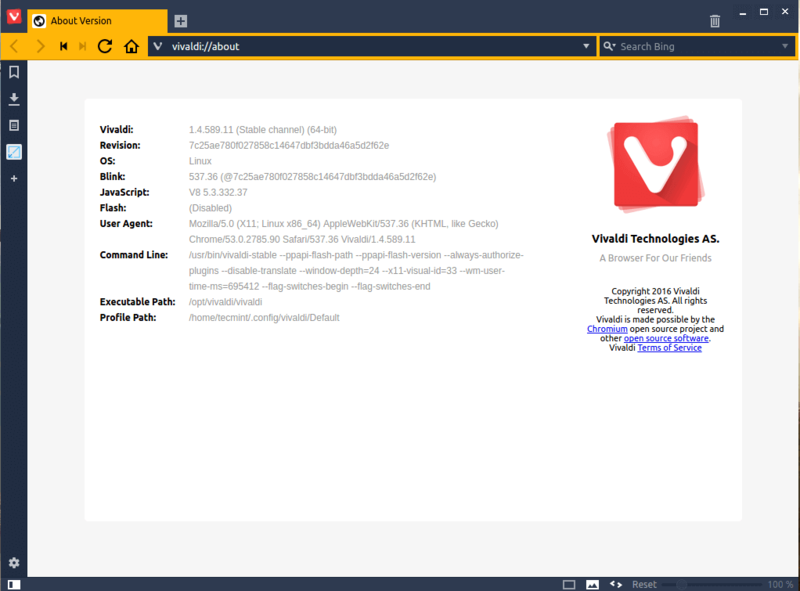 Search box: There are various ways to search the web in Vivaldi; via the Search Field, Address Field, from Quick Commands and now – directly from the Start Page. Pop out Videos: Users can now see HTML5 videos in a popup floating window while browsing. Netflix Support: Users can now watch Netflix, Prime Video, etc. in Vivaldi. Control Sound: Users can mute the sound of tabs playing media. Quick Commands : For those who prefer keyboard as input over other input devices, this feature lets user to search through various settings, tabs, bookmarks and history with a keyboard shortcut. This feature aims at allowing users to create their custom commands and run them as and when required. Notes : This feature allows user to take notes while browsing and add screenshots. The notes will keep track of the website you were browsing while taking notes. Moreover you can add tags to the notes and organize so that it can be find later. Speed Dials : A graphical blocks of favorite sites grouped together so that you can access them from a single window. The most powerful fact of this feature is you can add a folder to speed dial as well. Tab Stacks : Group multiple tabs together using tab stack so that when an end user is working with too many unorganized tabs, things are not messy. This feature makes it possible to group multiple tabs into single thus organizing your work. Higher level of customization : User can disable tab stacking, place tab bar at top/bottom left/right and change tab cycling order. Site info : This feature provides you with the details of cookies and site data as well as let you view connection information, a security measure implementation. After a months of development, long preview session and “millions” of downloads, finally the Vivaldi browser released its stable version 1.4 and comes with many features such as browser speed dial, custom themes, themes scheduling, custom notes, custom search support, improved tabbing and a variety of other features. 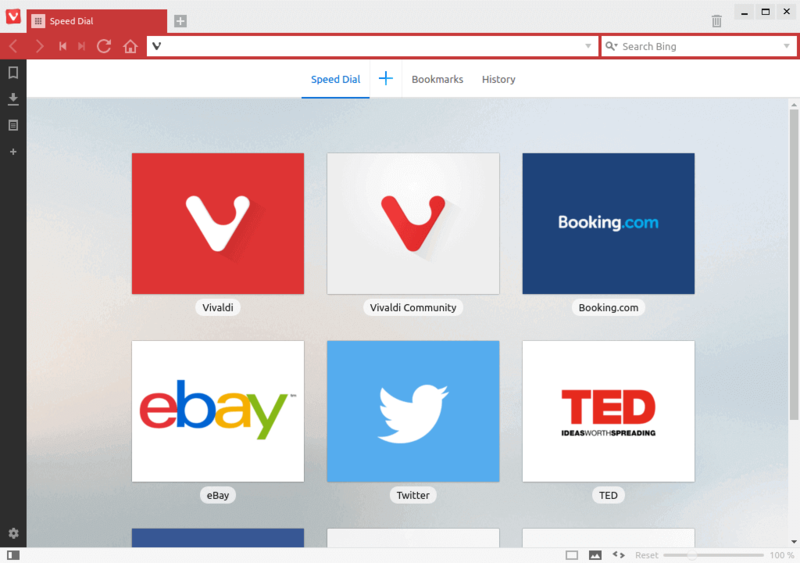 The Vivaldi web browser is available for all major platforms like Windows, Mac and Linux. It can be downloaded from the link below. Choose package as per your Linux distribution and architecture. Alternatively, you may use following wget command to download and install Vivaldi on your Linux distributions as shown below. The user interface seems lucid and clear. A folder based speed dial that contains similar type tabs and dials grouped together. Nice implementation from opera. Loading of a web page was smooth. The page loaded with all the text, images and ads without truncation. Take notes and add screenshot to it. The piece of code is intelligent enough to remember the website you were visiting while adding notes. Bookmarks – save the sites you want to refer to, later or your frequently visited sites. When I tried to close the application using close button, it didn’t work for some reason (don’t know why). So I went to files and then clicked EXIT. The project is promising. The glimpse of what it can do in the first release is very lucid. It’s fast as chrome having the legacy of Opera. Its features like taking notes and adding screenshot while browsing and others will make this browser very handy. Very sure this will give tough competition to other web browsers in the market. I was using chrome primarily (because of chrome speed) and Firefox at second place (since it has a lot of plugins and extension support) for some dedicated task but I must say I will have a Vivaldi launcher in my docky from now. Its just Awesome. 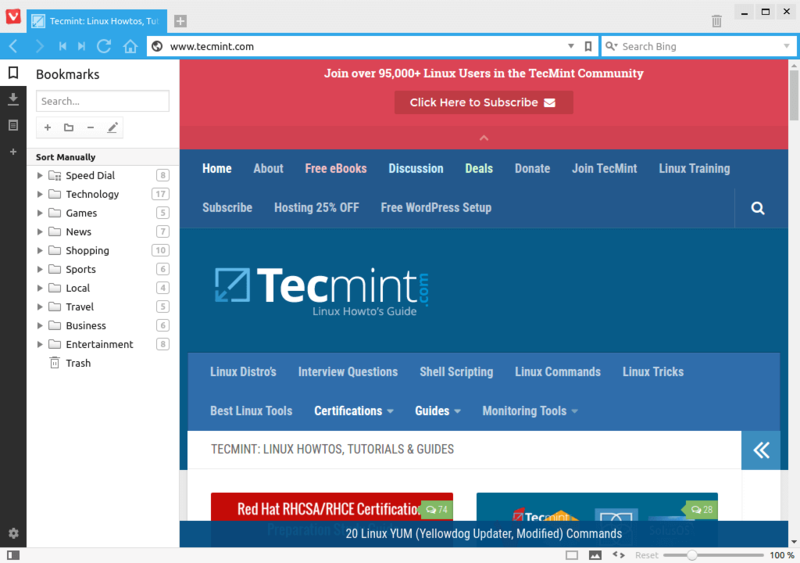 You should try Vivaldi web browser if you want to get something new. 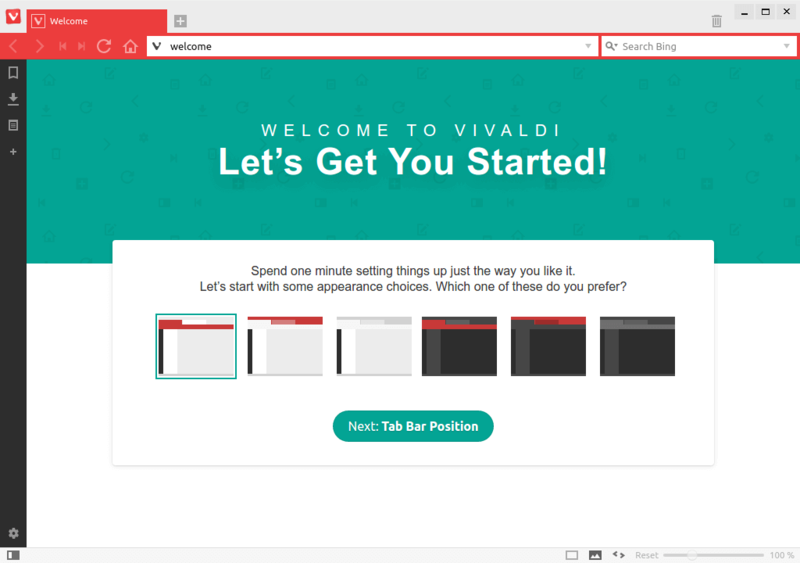 Vivaldi will change the way of surfing Internet for sure. Keep connected. Keep Commenting! Mr. Saive in Debian/Ubuntu/Mint On 64-Bit System architeture you provide a “.rpm” file rather than an actual .deb. Please fix it I’m really excited about Vivaldi (cause it’s developed by an Opera programmer and I really find Opera so cool) and want to make a testdrive with it. Thanks for notifying us, corrected in the writeup and included correct DEB package for the Debian/Ubuntu and Mint. Ravi, Thanks for this article. I tried to install Vivaldi on my Linux Mint 13, but it is running into a problem right from the beginning. Connecting to download.vivaldi.com (download.vivaldi.com)|92.242.132.27|:443… failed: Connection timed out. Sorry for the trouble, it’s due to missing links, I’ve just updated the links with most recent version, hope it will work for you.. Selecting previously unselected package vivaldi-stable. Version of libnss3 on system is 3.13.1.with.ckbi.1.88-1ubuntu6. As I said latest version of Vivaldi browser requires more recent version of libnss3 (>= 3.17.2) libraries to function properly, the only way to install latest Vivaldi you should do a system upgrade…. It’s about time a good successor to Opera 12.17 came along. However, I found that the RAM consumption is greater than Google Chrome with having its own technologies running on top of the Chromium back end. I hope this would improve overtime, but for now I’m sticking to Polarity for Windows and Midori for Linux. How about any plugins or extensions? Also how much memory does it eat compared to Chrome?